The weather is still pretty mild for the season. We've had no strong frost yet. Which means some of the summer flowers are still blooming. And I sewed this little rosebud scrap quilt. I now have 6 little scrap quilt tops ready for quilting. Nice little projects for the holiday season. In January, I'd like to start working on larger quilts again. The rosebud scrap quilt is awesome! Love your little rosebud quilt! I hope Father Christmas is good to you. Fabulous little quilt, Francoise, I love those bright colours, what a combination! 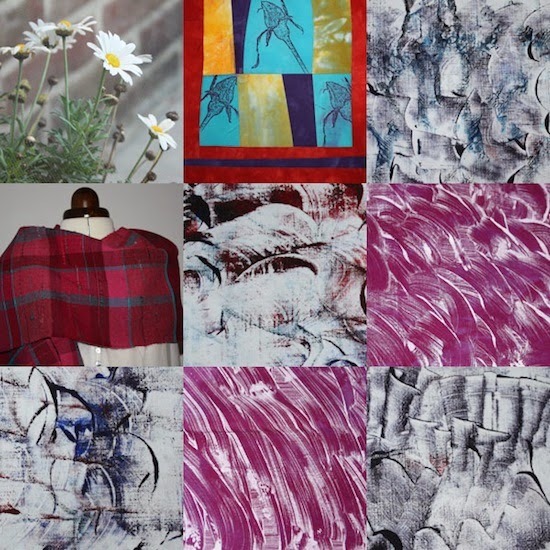 Is that one of your weaving projects amongst your lovely mono prints, it looks beautiful. You are always so creative! 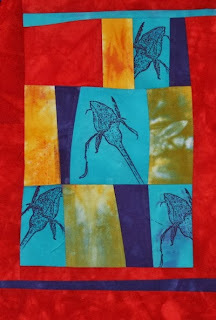 Love the mono prints and the way you included the rosebud! Your rosebud quilt is just gorgeous & I like your mono prints too.